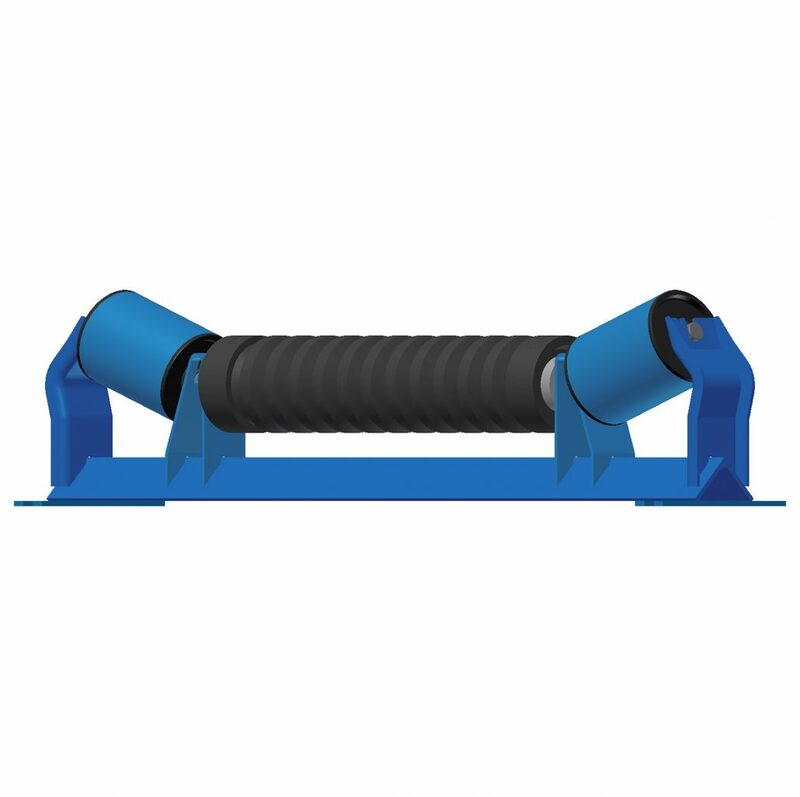 One of the most misunderstood belt conveyor idler assembly types in the industry is the “mighty” picking idler. It is also known as an “unequal” troughing idler however the former name for this assembly is perhaps more descriptive. While the wing rollers in the assembly will still form the conveyor belt that it carries into a trough shape, perhaps the most recognizable feature of this type of idler assembly is the fact that the middle roller(s) is longer than the wing rollers, thus making it an “unequal” idler. The moniker “picking idler” therefore comes from one use of this type of idler in food processing plants whereby slow-moving conveyor belts loaded with fruit, vegetables, etc. will allow for workers to “pick” the undesirable product off of the belt, due to the low trough height. A very common use of this type of idler assembly is with belt feeders. Here the material is fed onto the slow-moving belt, either with a columnar load from a hopper or chute directly on the belt or from a gate above. With the wide, shallow loading of this kind of a conveyor, a screen deck, for example, can be fed with material for optimum screening effectiveness. Generally the preferred idler type will be one with an impact roller(s) in the middle and steel wing rollers. Therefore you get the benefit of having the impact rollers to absorb any shock loading, as well as preventing material build-up on the surface of the roller. You would then use the steel wing rollers instead of the impact design, which will eliminate the possibility of the belt edge getting caught in the grooves of an impact design wing roller. With the long middle span, load-carrying consideration must obviously always be taken and the common solution is to have multiple rollers in the middle with unequal roll lengths. This way the roller gap is never an issue for the belt because the idler assemblies will be installed in an alternate pattern so that the gap is offset on every second idler assembly. As with most load zones, the skirting of the chute will come down to a level inside and below the top edge of the wing rollers and so maintenance considerations must be made, in that the correct frame style must be selected. Everyone has heard of the horror stories of trying to replace the middle roller(s) on a picking idler when there is no way to get the roller or frame out without the use of a cutting torch. This is due to having idler frames installed that do not have removable end brackets. With the chute skirting interference plus the weight of the belt on the middle roller(s), typically the only way to get the roller(s) out is to un-bolt and remove the removable end bracket, un-bolt the frame from the structure, push the idler out the far side and then you can simply lift the roller(s) out of the slots. Without the removable end brackets, the maintenance people are left to their own creative removal methods including cutting off one end of the mounting brackets so that they can be tilted over, cutting out structure. A creative application for the use of picking idlers resulted from a distributor sales representative who came to Luff Industries for a solution for one of his pulp mill customers in Western Canada. The pulp mill was having issues with their belts heating up due to excessive friction on slider conveyor. The conveyor had been modified from a chain conveyor design and UHMW slider strips had been installed on a 100-foot long conveyor. The weight of the wood chips on the belt caused heat build-up due to the un-broken surface contact with the belt, even to the point that a fire broke out. The solution – Luff Industries supplied custom frames with standard impact middle rollers and steel wing rollers to allow for the belt to be lifted off the surface every 72” to allow for heat dissipation. In addition, the customer requested that we provide horizontal frame slots so that the rollers could be removed horizontally instead of the typical vertical frame slots, due to the difficulty to lift the belt. Therefore, roller change out can be done in minutes instead of hours.